Milena Maneva-Valcheva was born in the city of Dobrich where she completed her secondary education and where she commenced her artistic and teaching career. In the year 1991 she graduated from the Academy of Music and Dance Arts – Plovdiv, with a Music Pedagogy major. In 2010 she earned a Doctor of Arts degree from the New Bulgarian University – Sofia. 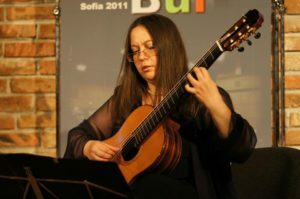 From the autumn of 1991 and currently she has been working as a guitar teacher at the Dobrin Petkov National School of Music and Dance – Plovdiv. She has also worked part-time as a guitar teacher at the Academy of Music, Dance and Fine Arts – Plovdiv and at the Paisii Hilendarski State University – Plovdiv. Since 1988 she has actively performed in a duo with her husband Valentin Valchev, giving concerts in Bulgaria, Denmark, England, Germany, Greece, Romania, Slovakia, France, Belgium, Turkey, Cyprus, Switzerland. She has also performed on stage as part of various chamber ensembles – with violin, flute, percussion instruments, as a soloist of chamber and symphony orchestras, etc. Mrs Valcheva has led seminars and master classes aimed at young guitarists’ skills advancement in Greece, Slovakia, Serbia and Montenegro, Cyprus, Turkey, Italy. She is the author of numerous transcriptions for two or more guitars of works by J.S.Bach, Scarlatti, Viana, Piazzolla, Gershwin, Malats, Joplin. She has established herself as a trusted expert on digital music score-writing, and she is well-known far beyond the borders of Bulgaria. She has done the pre-press work for a number of music scores for some of the most prestigious specialized publishing houses.